NEWMARKET, Ont. 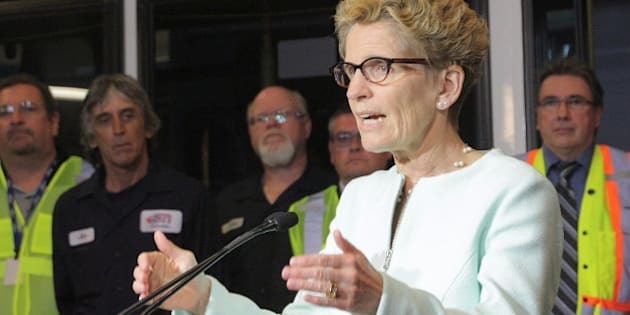 - It should come as no surprise that police are actively investigating the gas plants scandal, Liberal Premier Kathleen Wynne said Friday as she pleaded with Ontario voters to judge her on her record and campaign platform. Speaking at a campaign event less than a week before the election, Wynne urged people to consider how she has handled the scandal, and to focus on the "stark" choice they must make about the province's economic future. "On election day, on June 12, I'll be judged on all of that — on whether under my leadership I've done everything to ensure these mistakes won't happen, and on the virtues of my plan," Wynne said. "I'm comfortable with that because I know I've kept my word." On Thursday, provincial police investigating the alleged destruction of government documents related to the cancellation of two gas plants served the legislative assembly with a court order for logs showing who had entered the legislature. "The production order issued by the court was basically delivered by fax to the employees of the legislature," said OPP Sgt. Pierre Chamberlain. "It's not unlike a search warrant in that the police are looking for something, but in this particular case because our investigators knew exactly what they were looking for they were able to ask for the Ontario legislature to be ordered by the court to give up specific documents." Police also confirmed having interviewed Wynne's predecessor, Dalton McGuinty, but rejected suggestions the timing of the court order was to counter ads produced by the OPP union this week attacking the Progressive Conservatives. "I'm sure there's lots of fodder for conspiracy theorists unfortunately, but the reality of the situation is that the timing is totally part of the ongoing OPP investigation," said Chamberlain. "It should be viewed exclusively in that light, but we know that there are people who are going to use that information for whatever means that they require." Wynne was adamant the police probe has not affected her office, cabinet or caucus. It was under McGuinty that the Liberal government cancelled the plants in Oakville and Mississauga — a political decision the opposition parties say was made to save Liberal seats. The fiasco will end up costing taxpayers an estimated $1.1 billion and has dogged Wynne throughout the campaign. Provincial police had earlier seized 24 computer hard drives from the premier's office and determined some had been wiped clean of data during the transition of power from McGuinty to Wynne. McGuinty himself is not a target of the probe, which is focused on his former chief of staff, David Livingston, who has denied any wrongdoing. Still, the Progressive Conservatives seized on the police action to demand Wynne make all relevant documents public immediately. "Voters aren't going to stand for a coverup — they want answers," Tory Leader Tim Hudak said. "This is a moment of truth for Kathleen Wynne." The New Democrats called the court order another reminder of why the province needs a change of government. "People are tired of the stench of corruption in this province and they want it cleaned up," NDP Leader Andrea Horwath said. "This election is about corruption. This is a referendum on corruption." Wynne said the logs showing who was signed into the legislature between Jan. 2010 and March 2014 were not in her government's possession and she had no authority to direct the legislative assembly, which was co-operating with police. She also defended her record related to the scandal. "I made a clear promise to the people of Ontario that my government and I would be open and transparent on the matter of the relocation of the gas plants," Wynne said. "We have been and we will continue to be. I was the premier who opened up the process." While the scandal has cast a long shadow over the election campaign, Wynne kept coming back to the future. "I will work tirelessly over the next six days to make the case that the best way forward is our plan for jobs and growth and not Mr. Hudak's plan for cuts and chaos," Wynne said. Wynne's comments came at a bus yard, where she touted her $29-billion plan for transit in Ontario.